In stark contrast, two Collaborative practice groups consistently attract anywhere from 10-30 attendees monthly…Silicon Valley and Pasadena. For these groups, attendance has grown over time. What’s more, many presenters have found something else unexpected happening. They are getting clients! Divorce Options attendees were reaching out to them for a variety services including Collaboration, mediation, consulting, planning and even litigation. The CP Cal Divorce Options committee set out this year to discover what these two and other Collaborative groups were doing right by asking each California Collaborative practice group “what’s working for them and why do they think so?” and “what’s not working and why do they think not?”. The responses the committee got from the practice groups has resulted in a list of Divorce Options Best Practices, the most consistent of which is the presence in the group of at least one Divorce Options “champion” and proactive outreach on a consistent basis to proven referral sources using face-to-face as well as electronic tools. Aggressive marketing on a continual basis by the whole Collaborative group membership to potential attendees using proven social media marketing platforms was a primary best practice. To explain our results, the we created two back-to-back workshops for Saturday morning at the CP Cal Conference (Celebration) on April 28, 2018 in San Mateo. The first workshop, “Best Practices Divorce Options”, at 9am, will be presented by Ria Severance, Lissa Rapoport and Don Blythe. This workshop will focus on what the practice groups told us seems to work and what doesn’t. Ria, Lissa and Don, each seasoned DO workshop presenters, will also share their personal experiences and invite those who attend this workshop to share theirs. Immediately following, we will present a related workshop entitled “Social Media Marketing for Divorce Options” at 10:30am. The presenters are Beth Proudfoot, Lissa Rapoport and Don Blythe. The deliverables from this workshop are two-fold. First, we will describe the thirteen (13) social media marketing platforms that work, have low-or-no cost and are easy enough that many 5th graders seem to be able to master them. These 13 social media platforms include WordPress blogging web management software, Face Book, LinkedIn, Constant Contact Email Newsletters and developing email opt-out databases of referral sources, Next Door, Meetup, Event Brite, Craig’s List, Signup Genius, Zoom video-conferencing and U-Tube, Instagram and Twitter and a newly created one-hour Divorce Options Zoom Webinar. The second goal is to invite each attendee at the “Social Media Marketing for Divorce Options” workshop to join a Social Media Marketing for Divorce Options users-group that will meet using Zoom Webinar software over the next twelve (12) months. Hence, this group will show users how to implement and optimize for themselves each of the thirteen social media marketing platforms just outlined. Ria, Beth, Lissa, Don and others will facilitate those 12 monthly Zoom users-group meetings and be available between the meetings to answer questions and help navigate difficulties. The goal is to help each Collaborative practice group in California that participates in the users-group to achieve and maintain, if desired, within one year a monthly 3-hour face-to-face Divorce Options workshop with 15-25 average attendees as well as one monthly mid-week noon 1-hour Divorce Options webinar directed at local referral groups with 15-25 average attendees. Admittedly the goal is ambitious. But we are hopeful, working together, we can achieve it. 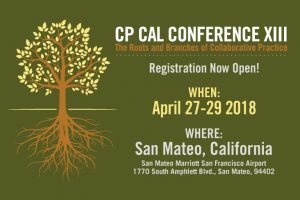 Hope to see you at the CP Cal Conference XIII in San Mateo!